Emerging from a Greek settlement founded between the 3rd and 4th centuries, the height of Split's history came in 295 AD when Roman emperor Diocletian ordered a residence to be built there for his retirement. It took ten years to build this magnificent palace and Diocletian lived there until his death in 313 AD. After that, many Roman rulers continued to use it as a retreat. In the 7th century, when the Roman colony of Salona was abandoned, many of its inhabitants sought sanctuary behind the palace's high walls and their descendants lived there until the present day. The city enjoyed a good degree of autonomy between the 12th and 14th centuries before it was conquered by the Venetians in 1420. After the fall of Venetian rule in 1797, Split was ruled by the Austrians, and briefly by the French, before becoming part of the Yugoslavia that was formed in 1918. Much of its development occurred after 1920 when Zadar, Dalmatia's official capital, became an Italian enclave. In 1941, the city was occupied by the Italians and a very strong resistance movement soon evolved and the city was first liberated in 1943, after the capitulation of Italy, and then finally in October of 1944 when the first people's government of Croatia was formed. 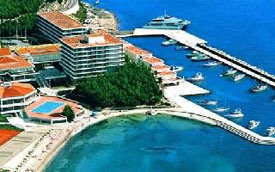 Le M'ridien Lav, Split will be located at Podstrana, eight kilometers south of Split. Beautiful setting will feature 800 meters of beach frontage, gardens landscaped by award-winning designer, Jim Nicolay of Hawaii, and fantastic sea views overlooking Split and the surrounding islands. In the place of ex old factory built almost 100 years ago, today stands fully refurbished and reconstructed, the most exciting and fashionable boutique hotel. 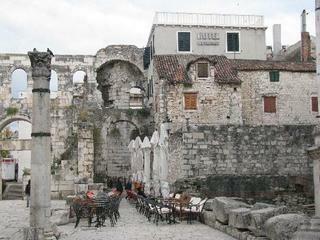 In ancient town of Split you may now enjoy old world charm and state of the art luxury. Hotel Luxe features comfortable and modern rooms, cosy wellness area, dining room and lobby bar with the view of Split city life. 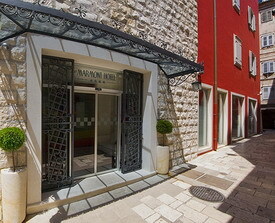 Marmont Hotel is situated right in the heart of the old vibrant city, inside the walls of the Diocletian Palace which has been declared a World Heritage site by the UNESCO. That is one of the reasons why the hotel is an extremely appealing place for all who want to be inspired by the Mediterranean spirit and to sense the rhythm of life in this city. The recently renovated hotel, first in town and region with fours stars, is completely air-conditioned and enriched with new amenities, offers 54 luxurious equipped rooms and 3 suites, a first class restaurant, conference facilities, a wellness centre and a large terrace with palm trees and real Mediterranean atmosphere. The hotel is located in the elite part of town, next to the famous beach Baèvice (blue flag award), 10 minutes walking to the centre (Diocletian’s Palace) and 5 walking to the ferry, bus, and railway terminals. In its spectacular location, the Peristil hotel*** awaits you in the very heart of the historical centre of the City of Split. 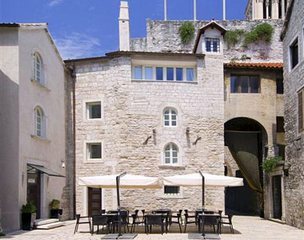 Within the Diocletian palace, the World Heritage monument under the aegis of the UNESCO organization, the hotel is situated just a couple of steps away from the Silver Door. 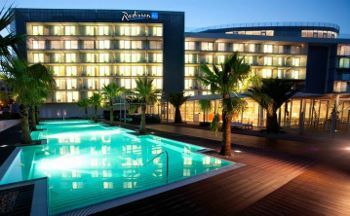 The hottest new hotel in Split and - at last - one which caters to both the business and leisure markets. 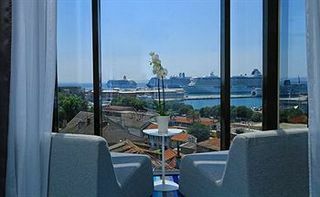 The spacious terraces off rooms, interior spaces and restaurants offer fabulous views of the Adriatic sea and Dalmatian islands to make this a true resort within a city. Within the palace walls and accessed through the ancient vestibule, the interior of this building has been carefully renovated to expose Roman stone and brickwork, which have been cleverly combined with more modern, minimalist designer details. The Villa Dobric is not physically connected to the vestibule but in a very simalar style stoned building this new addition to Vestibule is wonderful. Offering rooms at a little lesser price.